September 17, 2014 by Ecommerce News. About Statistics with tags Austria, Germany, Switzerland, The Netherlands. 37442 views. What are the biggest online stores in leading ecommerce countries like Germany or the Netherlands and which players dominate the ecommerce industry in the Alps? We’ve got the answers for you and we can already give one thing away: Amazon is everywhere and seems very unstoppable. In Germany it’s Amazon that has generated the most money selling products online. The German branch of the American ecommerce company has sold products worth 5.8 billion euros during last year. But it’s not only Amazon.de that accounted for this amount, the Amazon-owned ecommerce sites de.buyvip.com and Javari.de also made their contribution. Otto Group’s ecommerce flagship Otto.de generated 1.9 billion euros. But Otto Group also has some other sites playing a prominent role in the German ecommerce industry, with Bonprix.de and Baur.de that can also be found in the top 100. And with revenues of 702 million euros, Zalando.de has replaced Notebooksbilliger.de as the new number three on the list. 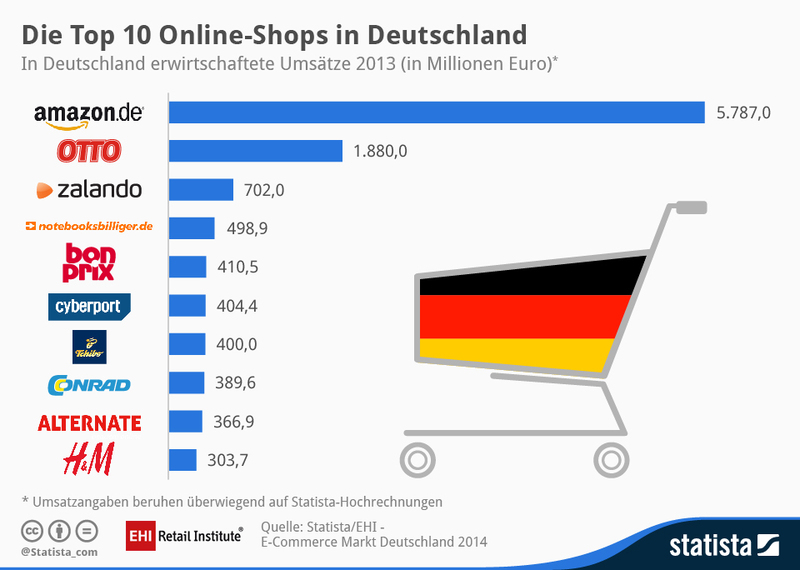 The top 100 ecommerce sites in Germany generated sales of 19.6 billion euros during 2013. That’s an increase of nearly 7.7 percent compared to the previous year, when the top 100 players generated 18.2 billion euros. And when sales from Amazon.de aren’t included, that growth is only 2.8 percent. This is apparent from the study “E-Commerce-Markt Deutschland 2014” from EHI and Statista, that will be released on October 21st. In the Netherlands the top 100 of online stores have generated 5.24 billion euros during 2013. But what’s most fascinating is that more than half of this money (50.5%) was generated by only the top ten players! And this share has only been growing the last couple of years (2011: 45.9%, 2012: 49.4%). It’s still unknown who the biggest ecommerce sites in the Netherlands exactly are, the latest edition from the Twinkle100 gets published on September 23rd, but our guess is that it’s still players like Ahold (Bol.com, Ah.nl), RFS Holland Holding ((Wehkamp.nl, Fonq.nl) and Zalando who will dominate the list. Amazon is nowhere to be found in this list, as the ecommerce giant is still not officially active in the Netherlands, although rumors are getting stronger Amazon is planning a launch in this Western-European country. Going back to the research from EHI, it shows that the ecommerce industry in Germany is growing with a slower pace than the years before. But in Switzerland the sales growth has almost entirely came to a standstill. 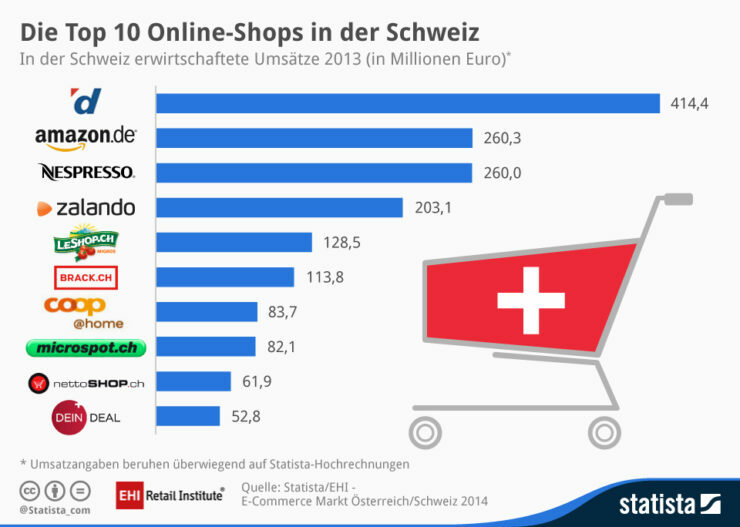 The top 100 online shops in Switzerland generated 3.4 billion euros during last year, contributing to an increase of only 3 percent compared to sales in 2012. With 414.4 million euros in sales (2013: €421.9mn), Digitec.ch is the biggest online store in Switzerland, followed by Amazon.de, which generated 260.32 million euros in the Central-European country. 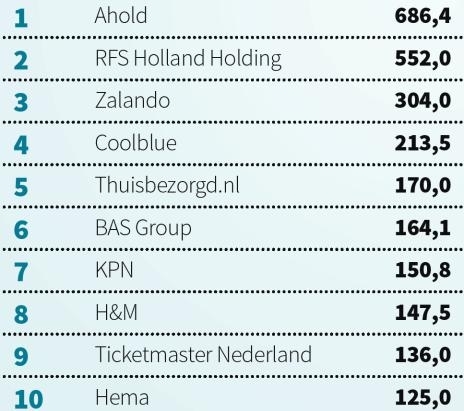 The third place on the list is for Nespresso.com/ch with 260 million euros, followed by Zalando.ch with 203.1 million euros. 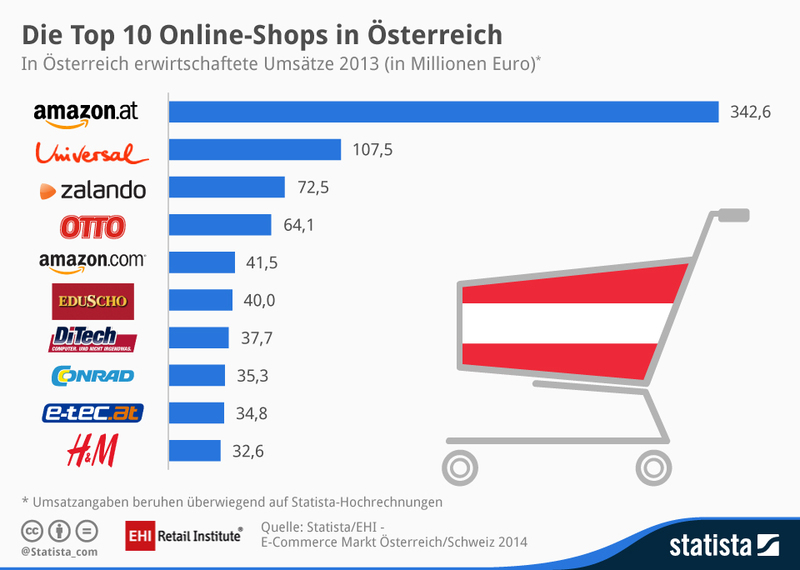 The top 100 online stores in Austria generated 1.6 billion euros worth of sales. And in this country it’s also Amazon who’s leading the pack. Amazon.at generated about 342 billion euros last year, more than any other Austrian ecommerce player did. Second place is for Universal.at, that sold products worth 107.5 million euros last year. And with revenus of 72.5 million euros Zalando has moved up to third place (just as in Germany) as it replaced Otto.de. More about Austria, Germany, Switzerland or The Netherlands.